Pululu Cute Pet Casual Game is a free to play virtual pet game published by ZT.art. The game is suitable for all ages and offers in-app purchases. Are you looking to raise a cute little pet and take care of it? You should definitely consider Pululu. Okay, let’s be honest here. 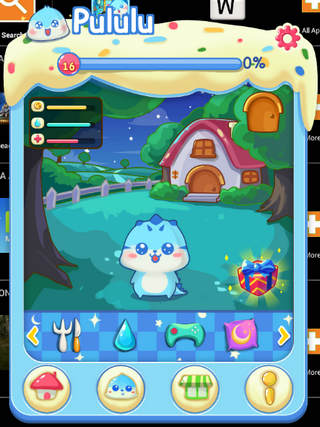 Pululu looks extremely cute and yeah, that’s why I downloaded the game initially. 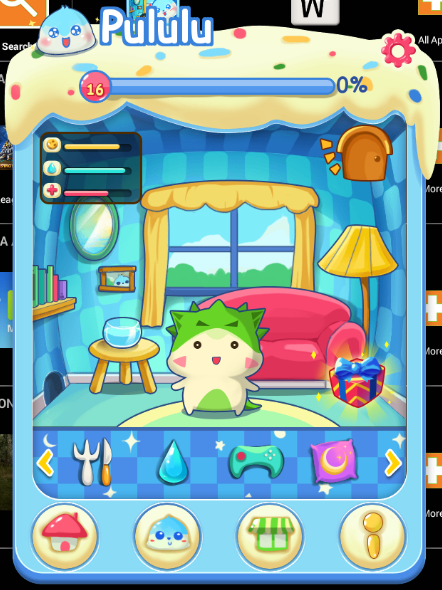 I also really like virtual pet games/pet raising games, so this seemed perfect. All graphics in this game are super cute and of good quality. This app is pure eye candy… and it has more to offer! Pululu makes cute sounds when you pet it, feed it, bathe it, etc. Plus there is nice music in some of the games. My favorite game is the card game, “Tap me Tender, Tap me Right”. I love playing it and the music it makes. Overall, the music and sound effects are great. Although I like the music for GAGA Game so much, I wish it would continue playing during the game. Are you looking for a friend who’s always there for you? That would be Pululu! Pululu starts off as a tiny dragon, who will grow up to be a “big” dragon. You take care of Pululu by petting it, feeding it, cleaning it and playing games. When I first tried Pululu, which must be over a year ago, there was not much to it. Pululu eventually grew up and that was it. There was 1 mini-game to play and I would eventually get tired of doing the same thing without anything new awaiting to happen. Now, however, the game is much more fun! 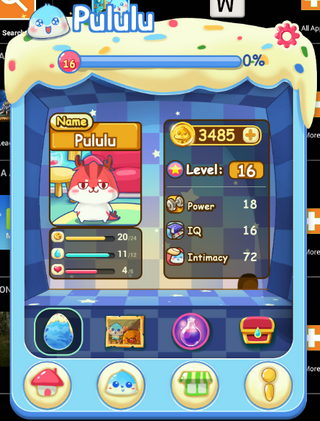 There are multiple mini-games to earn experience and money and Pululu can transform into a different species. Pululu doesn’t seem to gain experience easily; I find raising its level to be rather slow paced. Pululu also doesn’t seem to need food and drinks all that often, but that’s good, because I woudn’t want to take care of a pet whose hunger drains drastically every few hours. Overall, Pululu Cute Pet Casual Game is a fun app with plenty of things to do. What’s too bad though, is… it hasn’t been updated since August 2014. Initially, Pululu stays on the side of your screen, even when you’re not playing. I understand that this can be seen as ‘cute’, but for me it seems rather obtrusive. Luckily, it is possible to disable this feature in the settings. Some of the mini-games need to be downloaded separately, which is kind of annoying. On some mini-games, when you start it up, you get to see an ad which prevents you from starting the game. You have to exit the game and restart it, and then it should function properly. One mini-game, which is required to be played in order to be able to unlock some giftboxes, does not exist. 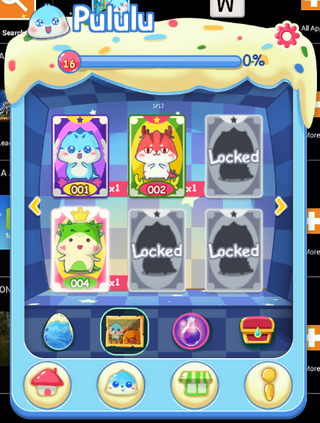 A huge down side, since the items from those boxes are necessary to unlock new Pululu species. I wish the game was fullscreen, rather than a little window. On a Samsung Galaxy Gio, it is pretty hard to touch what I want to touch. If the screen was full size, that would probably help. 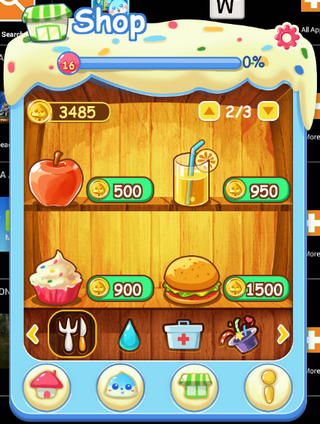 It has just two quests (tasks)… one is receiving a reward for logging in 7 days in a row, which is only once, the second is receiving 500 coins every day. It’s not much and not enough to keep you coming back. Pululu is a nice and entertaining virtual pet raising simulator with cute graphics and nice games. There are plenty of things to do in the game, so you will be able to entertain yourself and enjoy yourself for quite a while.